South Beach, Florida. Miami-Dade Real estate, condos, appraisal facts, links, photos, news and blogs. Brittex Appraisal Services, Inc. The southern portion of Miami Beach is known as "South Beach." Photo by Britt J. Rosen - Copyrighted (2005) - Looking north from "Sofi"
The area stretches from South Pointe Park at the southern most tip of the island of Miami Beach, north to 17th Street. It is world famous for its Art Deco architecture, as well as for its shopping and entertainment amenities which include numerous restaurants, night clubs and a strand of premier beach bordering the Atlantic Ocean. South Beach’s strand of beach ranks as one of the Travel Channels’ top ten beaches in the world. The Surfrider Foundation voted it the premier urban beach in the United States. Occupying less than two square miles on the southern tip of Miami Beach, South Beach’s subtropical sandbar has an identity of its own. South Beach's Art Deco District contains over 800 buildings in a distinct architectural style. Ocean Drive is rather known for its lively activity and sidewalk cafés. The area has also become a favored location for films, music and television shows and scenery for fashion shoots. The Art Deco Historic District, with the largest concentration of 1920's and 1930s architecture in the world, is listed in the National Register of Historic Places and recognized globally as one of Greater Miami and the Beaches’ unique attractions. Development in the district continued during the 1930s and 1940s. Buildings constructed in the Art Deco district during this time were mostly three-story walk up, many with exterior corridors. Many of these buildings incorporated the original “art deco” design. By the mid-1950s, most of the land area in the neighborhood had been built upon, and the area reached the mid-stage of its initial life cycle. The general economic conditions in the South Miami Beach area during the 1950s and early 1960s were relatively healthy. Lincoln Road Mall had become one of the premier shopping districts in the area. While there were new and more upscale hotels (like the Fontainebleau and Eden Roc) built to the north of South Beach, attractions like the Jackie Gleason Show at the Convention Center helped maintain the stability of the South Beach area. During this time period, the proportion of year round residents in the area increased. A notable trend of decline became evident in the late 1960s and early 1970s. The Art Deco District was largely becoming a home to lower income retirees from the northeast. Residential buildings in the area exhibited increasing signs of deferred maintenance. Hotels along Collins Avenue and Ocean Drive began to experience financial difficulties. Lincoln Road began to lose the reputation as Miami Beach’s most fashionable retail area, as the Bal Harbour Shops to the north provided increasing competition. This trend continued throughout the 1970s, despite some early efforts at revitalization. The first effort to reverse the trend of decline was the South Beach Redevelopment Plan in the early 1970s. The plan called for a complete reconstruction of virtually the entire area of Miami Beach south of 5th Street under a master plan concept, and included the construction of a series of canals and numerous high-density residential buildings. Land was to be acquired by a quasi-public agency with limited eminent domain powers. However, the redevelopment effort became mired in political disputes and never got off the ground, and as a result the area continued to decline. In the area to the north of 5th Street (essentially the Art Deco District, the Washington Avenue Commercial District and the Ocean Drive Entertainment District), community efforts for rejuvenation continued after the demise of the South Beach Redevelopment Plan during the latter part of the 1970s and into the early 1980s. However, the concept of a public or quasi-public agency acquiring land in a planned redevelopment effort would not be a component of any new plan. In essence, individual owners/investors would have to lead the way with individual projects. Some early efforts were undertaken, but it was not until the late 1980s to early 1990s that a critical mass was obtained. By 1990-1991, the rejuvenation of South Miami Beach was well underway. The Art Deco District was evolving as a viable rental area for younger and more affluent tenants. Many of the older residential buildings in the district were purchased by investors who completed significant rehabilitation, but generally retained the original unit mix. This area contains the city’s Art Deco District a one square mile area containing more than 650 architecturally significant buildings designed in the Art Deco and Mediterranean Revival styles. The area contains the largest collection of Art Deco architecture in the country. Developed in the 1930's when Art Deco was the contemporary style, the district is the Nation's youngest historical district and was placed in the National Register of Historic Places in 1979. Active apartment building operators included the Chrisken Group, Streamline and DACRA. These investors and others acquired numerous buildings in the Art Deco District in the late 1980s and early 1990s and completed a range of renovation/rehabilitations. The majority of the projects involved rehabilitations, which entailed new painting, some new appliances, floor refinishing, some new windows and some fixture upgrading. Generally, these projects are referred to as moderate rehabs. Rental rates obtained for the rehabilitated units were typically $150 to $200 per month higher than previously, and tenants tended to be much younger. In some of the buildings acquired, extensive reconfiguration and renovation were completed. In these projects, the original unit mix was substantially altered, usually to create fewer and larger units. These units generally were rented at the high end of the range for the district. Some early attempts at condominium conversion were made in the late 1980s and during 1990-91. In general, these early attempts were not very successful. However, the concept of condominiums in the area began to take hold during late 1991 and early 1992. Most of the condominium sale activity, which has taken place in the Art Deco District, has involved rehabilitations or renovations of older existing buildings. This is partly because zoning regulations in the district do not allow for demolition of existing structures. In an effort to preserve the Art Deco design of the area, the ordinance maintains that the exterior walls of any existing structure in the district may not be altered. Thus, rehabilitation/renovation must maintain the existing exterior of any existing building in the district. There is a very small inventory of vacant lots in the district. Most of the development took place prior to the 1950s. Since that time until relatively recently, it has not been feasible to develop these lots. With the successful renovation/conversion of existing buildings for a more upscale clientele, developers discovered that higher income residents could be drawn to the area, and the new condominium market began to evolve. During 2004-2006 the trend to condominium conversion of traditional apartment buildings was in full swing. This was the result, not only of the developers’ successful marketing efforts and the recent popularity of South Beach as an entertainment venue, but it is also reflective of the economic realities of the times. Landlords have been squeezed by rising operating costs that are largely driven by increased real estate taxes and, in the wake of several active hurricane seasons, sharply higher property insurance premiums. On the other hand, historically low mortgage interest rates were available to buyers for the past several years, driving an interest in equity ownership as opposed to renting. Thus, multi-family residential properties were attracting significant amounts of investment for the purpose of refurbishment, condominium conversion, and then re-sale as individual condominium units. The area located in the southernmost portion of the City of Miami Beach, south of Fifth Street, is known as “Sofi” for “South of Fifth” and previously known as the “Redevelopment Area.” Fifth Street is a geographic divider between north and south and a major thoroughfare of the area for east and westbound traffic. This area This the southernmost tip of Miami Beach known as South Pointe, adjacent to the Government Cut waterway, the access to the Port of Miami used primarily for the cruise lines and international cargo. While the redevelopment area no longer exists in South Pointe, the zoning of the area is still based upon performance standards zoning set down as part of the old plan. The old plan encouraged high density development, assemblages and development of this area which historically was made up of small commercial properties and apartment buildings whose improvements had reached the end of their economic life. The zoning in the rest of Miami Beach is mostly RM which is multifamily, and CD, a commercial zoning, in South Pointe there is RPS-1 (residential performance standard) 1 thru 4, and CPS (commercial performance standard) 1 thru 4. There are some extra requirements regarding open space in these areas, lot frontages and accessory uses. The zoning provides no large advantage relative to other portions of Miami Beach. Over the past ten years, among the most successful high rise luxury condominiums in Miami-Dade County were developed in the South Pointe area. Joe’s Stone Crab, Smith & Wolensky, and Penrods are all located in this “Sofi” area of South Beach and within walking distance of the subject. The Miami Beach Marina is also in this area, on the Biscayne Bay side of the island on the west portion of the neighborhood. Property values in the overall area have been increasing and continue to show steady growth. Lincoln Road has undergone extensive renovations and is steadily gaining popularity with the local residents as well as visitors to the area. The boundaries of the Art Deco District are: Hank Meyer Boulevard (17th Street) to the north, 6th Street to the south, Ocean Drive to the east and Lennox Avenue to the west. The neighborhood boundaries extend down to the southernmost tip of Miami Beach. 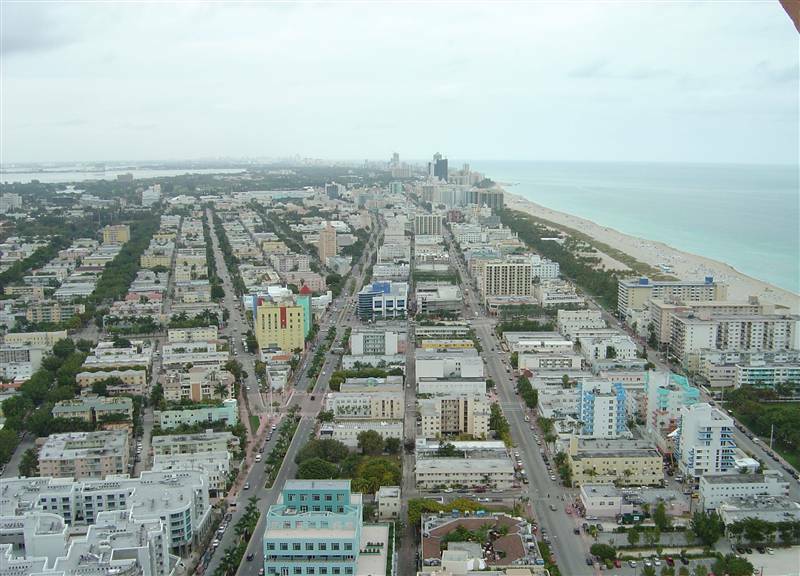 Miami Beach was incorporated in 1915 and, according to the year 2000 census, contains approximately 87,533 residents in a 7.1 square mile area. It is the fourth largest municipality in Miami-Dade County. The City of Miami Beach has long been a desirable tourist destination for both foreign and domestic travelers. With the redevelopment of south Miami Beach most beach hotels are filled to capacity with little or no vacancies. Aerial view of the area "south of fifth" or "Sofi"
View of Bently Bay Condo from pool deck. This building was designed by Arquitectonica to look like a sail.